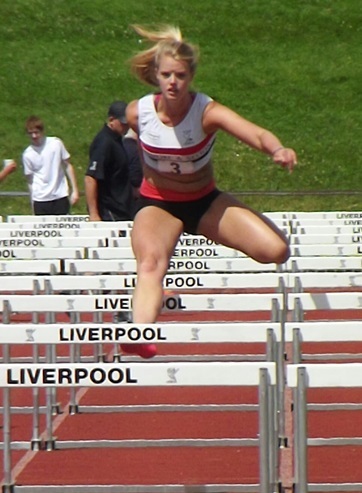 Four Liverpool Pembroke Sefton athletes were selected by their respective counties to represent them at the highly regarded English Schools Track and Field Championships at Birmingham. Two produced outstanding results. 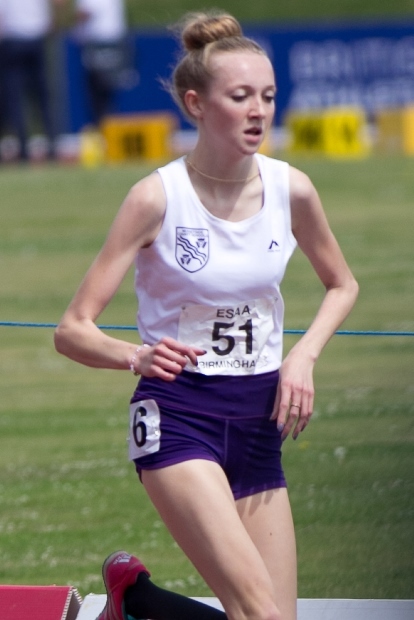 Amelia McLaughlin(Greater Manchester) took the Senior Girls High Jump title with 1.75m and can claim to be the most consistent high jumper on the circuit. Alone after the eliminations she went for 1.78m, a personal best. Agonisingly she got masses of height but marginally clipped the bar with her heel. After what seemed a long wait the bar toppled. The PB is postponed for a little while longer. this and set a blistering pace from the gun. Rosie lay in wait until the finishing straight but this time her renowned kick deserted her and she was unable to catch Sinah who edged home in 4.19.52 to Rosie`s 4.19.90. Nobody else was in the frame. Attention now turns to the Schools International at Cardiff. Others at Birmingham were Junior Boy Daniel Slater(Mersey) who failed to progress beyond his heat but with a decent 4.20.43 timing for 1500m. Intermediate Morgan Greaves-Thomas(Mersey) did indeed survive his 100m heat in 11.40 but succumbed in Round 2 with 11.50. At Hampden Park, Glasgow, in the televised Diamond league match, Michael Rimmer lined up against the world`s best 800m runner in the shape of Daniel Rudisha. The Kenyan was in a class of his own with a 1.43.34 timing but Michael fought all the way to finish third with an excellent 1.45.89, a time that is a European Championships qualifier. The club`s seniors were at Wavertree for the third match in the Division 2 series of the Northern League. This has proved to be an exciting league with all six clubs capable of winning. The LPS effort was characterised by numerous workmanlike performances. Among the men were winners in the shape of Nathan Hilton(400m in 49.4), Rob Parkinson(800m in 2.03.9) and Kyle Nicholls(3K Steeplechase in 10.53.2). Chris Arnold and Gary Ireland were massive point gatherers in the throwing events with Chris taking the Shot with an impressive 12.42m. The club`s 4 x 400m relay squad were, as usual, classy winners. 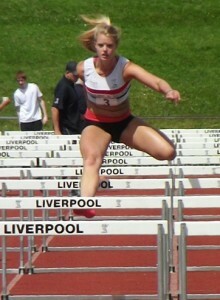 For the Women there was an unexpected double win in the 100m hurdles with Emma Givens(16.0) and Rachel Hutchinson(20.0). The latter also won the Hammer convincingly with 37.48m. Hidden away was probably the best performance of the day the 4 x 100m relay event where Aimee Hall, Emma Givens, Evelyn Smalley and Ella Barton combined for second team.